“My children go to a private school Madam, it is close to home, they learn English and mathematics”, says Selvi with a big smile on her face. Selvi, a Marathahalli-based domestic worker, like many others from low income households in Bangalore, finds private schools a better choice for her child. Research has often pointed out that there is not much difference in the learning outcomes of children in government schools and in private schools. Yet in Bengaluru, like many urban centres in the country, children across income groups are flocking to private schools. While the number of private schools are rapidly rising, government schools are increasingly being merged/shut down in the name of low student enrolment. The narrative around government schools remains one of poor accountability and infrastructure, poorly trained or absent teachers, poor attendance and pass rates of students. In 2016-17, Bangalore Urban had 1403 government schools, and almost thrice as many – 3426 – private schools. Student enrolments illustrate the trend better. That year, only 1.8 lakh children were enrolled in government schools, compared to nearly 11 lakh children in private schools. The most commonly cited concern about government schools is the lack of sufficient, well-qualified teachers. Dr V P Niranjan Aradhya, Programme Head (Right To Education) at the Centre for Child and Law, NLSIU, points out that there were over 28,000 vacancies for government elementary school teachers in Karnataka as of 2016-17. “The number of sanctioned posts was 1.94 lakh, but only 1.66 lakh teachers were working then. The department has been talking about plans to recruit teachers, but currently poorly-paid guest teachers are being appointed in many vacancies,” he says. Given the low rate of enrolment in government schools in the city, there are schools with only 10-15 students spread across grade 1-5, or schools that have only 30 students overall from class 1-7. Such schools often have only one or two teachers. These teachers have to teach every subject to students across all grades, even if they are not qualified for it, says Aradhya. Teachers are also burdened with additional duties and administrative tasks. There are even schools in the city that lack a Headmaster, requiring one among the skeletal teaching staff to do the additional administrative tasks of the HM. Anurag Behar, Vice Chancellor at Azim Premji University, says the low quality of schools comes down to the poor quality of teacher education. Behar was part of the implementation committee for the Justice J S Verma Commission report on teacher education. The Justice Verma Commission, set up by the Supreme Court, had pointed out in its 2012 report that the majority of Teacher Education Institutions (TEI) in the country were highly commercial private establishments. Behar says: “In the 1960s, India had only about 1300 TEIs. In the early 1990s, it was about 1500. Then, between 1993 and 2011, this number rose to about 16,000. In this period, the National Council for Teacher Education (NCTE) gave licenses to many private institutions that were fraudulent and corrupt; many of these institutions don’t even hold classes.” He says that out of nearly 18,000 TEIs in the country now, about 92% are private. Other issues pointed out by the Verma Commission Report include: teacher education curriculum remaining unchanged for over 65 years, TEIs being standalone institutions rather than being part of universities, the generalist nature of M.Ed programmes etc. The Commission had in fact reviewed 291 TEIs in Maharashtra, and recommended that 85% of these should be shut down. Though much of the Commission’s recommendations have been ignored, there have been a few initiatives such as the centre’s budget announcement this year to introduce an integrated B.Ed course. “But what about the existing 16,000-odd TEIs that are of low quality? Nothing much has been done about those,” says Behar. While shortage of qualified teachers is a major concern, both Aradhya and Behar say that teachers are not respected or incentivised enough in the education system. Teacher absenteeism – i.e., absence without a valid reason – has been blamed for much of the shortcomings of government schools. But a 2016 study by Azim Premji Foundation (APF) across over 600 schools in six states including Karnataka, had shown that teacher absenteeism was only 2.5%. However, the overall teacher absence was around 19%, which was due to other administrative or departmental work they were assigned, trainings, or legitimate leaves; that is, teachers were absent due to systemic issues rather than a lack of professionalism. The current system, wherein teachers’ promotions are based entirely on tenure, hardly incentivises high-performing teachers as well. Bengaluru’s government schools are also affected by bureaucratic procedures like frequent teacher transfers. “The transfer process is lengthy, and happens just a few months into the academic year. Events like elections can delay it even more. Neither the teacher nor the students would know if the teacher would remain in the school that year. This affects consistency in academic inputs,” says Kapil Dawda, Bengaluru City Director for the non-profit Teach for India. Teach for India’s fellows work as full-time teachers in low-income schools; currently they work with 24 government schools in the city. Jean Boddu, Senior Program Manager at Mentor Together, another non-profit that works with government schools, says the distribution of bags and books to students also gets delayed by 2-3 months from the start of the academic year. “Also, there is a huge dropout of students in 9th standard, as students who are academically weak are neglected, and fail exams.” Boddu says such students are not supported well enough as the school is worried that its 10th standard pass percentage may drop down if they continue there. In terms of infrastructure, Bengaluru’s government schools do have basic infrastructure like toilets and electricity, but in many cases the infrastructure is not functional. For example, schools that have toilets may lack water; or the toilet is kept locked. There is little investment in the operation and maintenance of existing infrastructure. 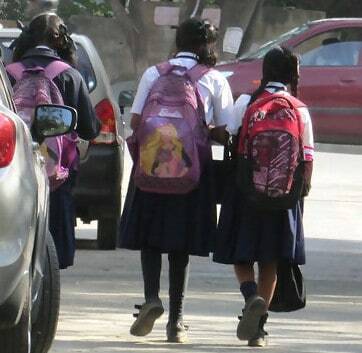 In Bengaluru, corporates have adopted many government schools, providing funds, books, infrastructure etc. Dawda says that schools located in areas like Whitefield which have a high concentration of corporates, tend to have better essential infrastructure because of this. “Government schools in these areas often have a science lab, computer lab etc., which schools in areas like Ejipura or Goripalya don’t have,” he says. Since such philanthropic work is not streamlined and coordinated by the Department of Public Instruction, the results are often skewed and less effective. Who monitors the quality of government schools? In education system, the Cluster Resource Person (CRP) who oversees some 10-12 government schools per cluster, is the academic authority, says Aradhya. “CRP has to monitor the quality of learning process, but he usually ends up doing administrative work and collecting data from schools. Parents also don’t know that it’s the CRP they have to approach, to hold their child’s school accountable,” he says. The Karnataka School Quality Assessment and Accreditation Council (KSQAAC) routinely assesses government schools in the state and accredits them. Schools have to undergo both a self-assessment and external assessment, and are graded on multiple aspects like learning achievement, learning environment and physical environment. They are then given accreditation in grades ranging from A+ to D.
The Council has routinely ranked schools poorly. In 2014-15, for example, it had assessed 1220 government schools, 917 aided schools and 24 unaided schools in the state. In Bangalore Urban overall (Bangalore North and South educational districts combined), out of 78 schools, no schools got A or A+ grade, and only eight got B+. Sixteen schools got B grade, 33 got C+, 17 got C and four schools got D grade. Aradhya opines that the accreditation system is useless as long as there is no initiative to improve the quality of schools. “If the government is providing functional infrastructure, recruiting teachers and monitoring the learning process in schools, then it has the right to give accreditation. Else, continuing this exercise without doing anything to improve quality, only sends the message that government schools are bad,” he says. While government schools compulsorily have to submit to the KSQAAC accreditation process, private schools are not bound to. In the current system, private schools can participate in the accreditation process if they want to, by paying a fee to KSQAAC. Very few usually do. Currently there isn’t a system to assess private schools on their quality. The majority of private schools in Bangalore are low-income schools without adequate infrastructure or well-qualified teachers. However parents are keen to send their children to these schools because of the English language education offered, and the general perception that these schools are better. Accountability remains the core difference between public schools and private ones, according to Shashi Kumar D, General Secretary of KAMS (Associated Management of Private Schools in Karnataka). “There are issues with private schools, they are not isolated from the problems of running a school. For example there may be a lacuna with the lessons offered, or the hire of unskilled teachers. But because of the pervasive accountability in these establishments the teachers increase their skills, knowledge and teaching ability,” Kumar says. However, research has often showed that there isn’t much of a difference in the quality of education in government and private schools. World Bank’s World Development Report 2018 says that, in the 40 countries it researched on, including India, there were no differences in the learning outcomes of children in private and public schools, given that they had matching familial backgrounds. Any marginal difference was because private schools mainly admitted students from advantaged backgrounds. That is, student performance depended on the student’s household, and not the quality of education offered by the school. Another study by APF in rural Andhra Pradesh in 2015 had shown similar results. Behar says, “There would be less than 2% private schools that are elite and actually have the resources to run a high quality school. But even their quality of education is suspect. The remaining low-fee private schools are mostly much worse in quality.” Behar says there would be only 10-15% private schools that are truly committed to providing good quality education. “For the rest, it is a business,” he says. Whether government schools will in fact get the right support, or whether they will continue to be shut down further in the name of low enrolment, remains to be seen. Note: Siddharth Anil Nair contributed to this story. This article is supported by SVP Cities of India Fellowship. This is the first part of the series on Quality of education in government schools.